Scientists have uncovered key processes in the healthy development of cells which line the human gut, furthering their understanding about the development of cancer. A University of East Anglia (UEA) study, published today in the journal Open Biology, shows that a protein called ninein is essential for normal tissue development in the gut. The research aimed to unravel some of the poorly-understood mechanisms involved in rearranging the internal 'skeleton' - cytoskeleton - in cells that are undergoing a shape change during normal development. 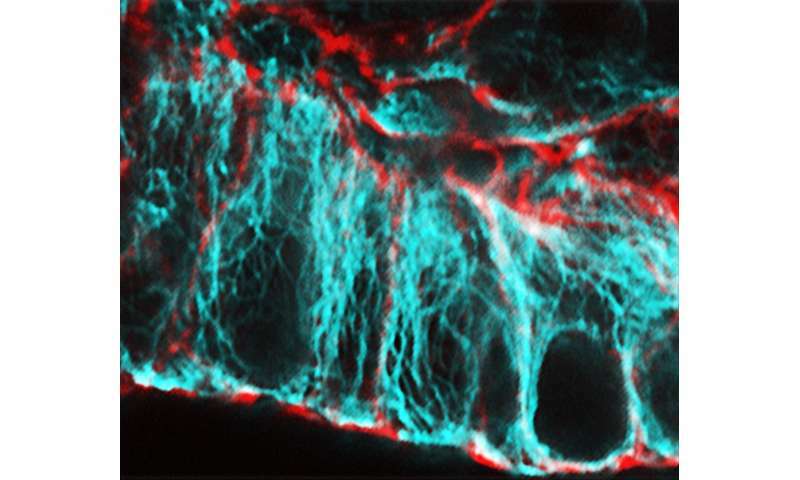 Using 'mini-guts' created in the lab, they studied the tubular filaments which are part of the cytoskeleton called microtubules, and their dramatic rearrangements during the formation of certain types of cells found for example in the gut. Dr Mette Mogensen from UEA's School of Biology said: "Formation of columnar epithelial cells like those lining the gut involves reorganisation of the microtubules, as well as the assembly of new Microtubule Organising Centres (MTOCs) which anchor one end of the microtubules to cell surfaces. "We found that this process can only happen correctly when the protein ninein is present. We also found that the microtubule-associated protein CLIP-170 is needed for the relocation of ninein to the new MTOCs. "The correct organisation of microtubules in columnar gut cells leads to the formation of a transcellular array. As well as influencing cell shape, microtubules form tracks for the transport of vesicles and molecules within cells, which enables nutrient uptake. "Loss of this transcellular microtubule array leads to loss of tissue architecture, function and ultimately cancer, so formation of these new MTOCs is critical." Researchers used 'mini-guts' during the study, generated from stem cells that are isolated from gut tissue and grown in a special medium. They formed structures in culture that mimic normal gut including columnar cells with transcellular microtubule arrays and new MTOCs. The research was funded by the BBSRC, Anatomical Society and BigC Appeal. 'Ninein is essential for apico-basal microtubule formation and CLIP-170 facilitates its redeployment to non-centrosomal microtubule organizing centres' is published in the journal Open Biology.